Cisco Aironet 802.11n access points include the Cisco Aironet 1250 Series, 1260 Series, 3500e Series, 3600e Series, and 1550 Series. These access points require the use of external antennas to make them fully functioning units. Although most existing Cisco antennas can be used, Cisco has developed antennas specifically designed for use with 802.11n access points to optimize performance. This document explains the antenna options for the Cisco Aironet 802.11n access points. Cisco offers a variety of antennas that provide different mounting options and coverage patterns. Customers can select an antenna that will increase the overall efficiency and data rates of their wireless network, while accommodating specific deployment conditions, including physical layout, distance, and aesthetics. To optimize the overall performance of a Cisco wireless LAN, it is important to understand how to maximize radio coverage with the appropriate antenna selection and placement. 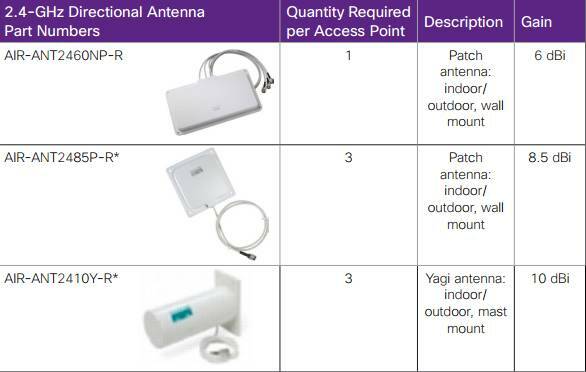 Table 1 describes three antenna types available for use with the 802.11n access points. Omnidirectional antennas are connected to the access point via short, attached plenum cables. The antennas can be mounted to a ceiling and provide a large, circular coverage area. 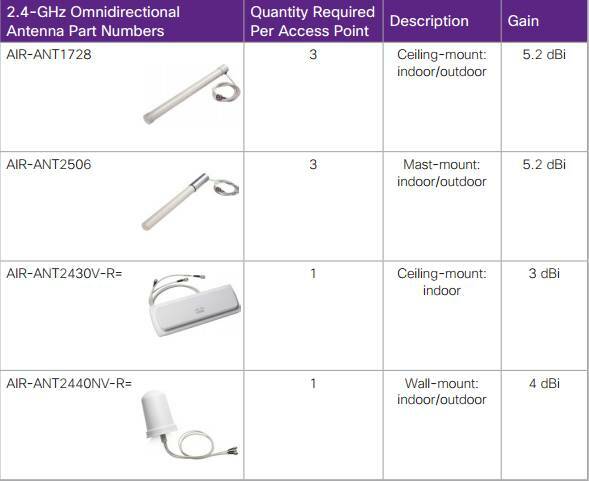 These antennas can be used both indoors and outdoors (see Table 2 for specific details for usage) and are typically mounted on a ceiling or mast-pole. Examples of places in which omnidirectional antennas are useful include warehouses, manufacturing floors, and other large areas, as well as outdoor seating areas, such as cafés or central gathering places for students. Omnidirectional antennas can also be used to provide good coverage in a retail environment, both inside and outside, as well as in areas where trucks or police cars park to upload data. Dipole antennas provide a large, circular coverage pattern. 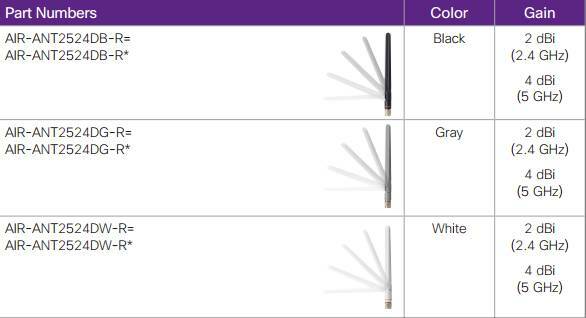 These antennas are available in three colors (white, black, and gray) so that they blend better into the area in which they are placed. The white and black dipole antennas can be bent in different angles to modify the coverage for wall and ceiling mounting as needed. The gray dipole does not offer this option and is shorter than its counterparts. If you need a reduced-sized antenna (for example, in an area where it’s undesirable to have dipoles projecting into the space), you should consider the short, white dipole. Other applications for dipoles include large, open areas like conference rooms or lecture halls. 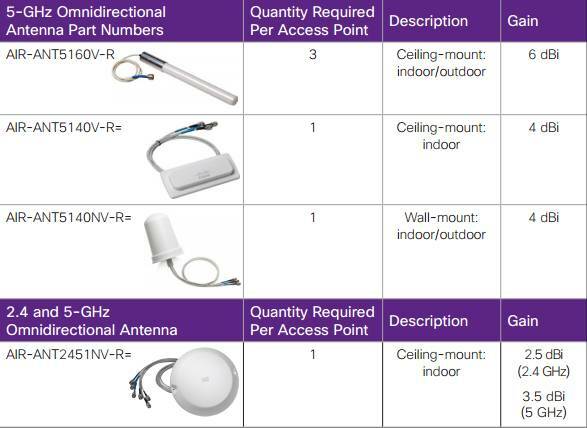 Areas requiring shared coverage – in which the access point is placed in the middle of the room or in a hallway, such as in a hotel or medical facility – are also a good use for the small form-factor dipole. Because of the circular pattern of coverage provided by dipole antennas, rooms located directly off the hallway may receive coverage as well. Table 3 lists the part numbers for single-band 2.4-GHz and 5-GHz dipole antennas. Directional antennas focus the radio signal in a given direction. This enhances the signal to and from the access point in the direction the antenna is pointing. Focusing the signal has the effect of providing more energy in one direction and less energy in all other directions. These antennas are typically mounted to a wall or a mast and provide coverage in a limited-angle pattern. Application cases for a directional antenna include RF coverage down a hallway in a hospital or office corridor. In a warehouse or manufacturing facility, which typically has high steel-shelving units, aiming a directional antenna down open areas provides coverage for people moving among the shelves with their wireless devices. The mining industry also benefits from the use of directional antennas when wireless is used in the shafts and drifts. 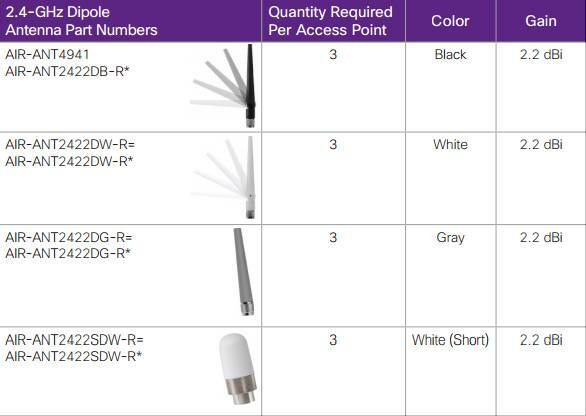 Table 4 shows the directional antennas available for use with the Cisco Aironet 802.11n access points. **Only approved for use with Cisco Aironet 3500p Series Access Point. The next generation of Cisco Aironet 802.11n access points–the Cisco Aironet 3600e Series and 1550 Series–requires the use of dual-band external antennas to make them fully functioning units. As these access points take greater advantage of the multiple-input multiple-output (MIMO) features supported under the 802.11n standard, the number of radio transceivers per frequency band has increased. Using dual-band antenna ports allows the access point to support these added transceivers while maintaining a reasonably low number of antenna connections. Each dual-band antenna can transmit or receive Wi-Fi signals in both the 2.4-GHz and 5-GHz bands simultaneously. Tables 5, 6, and 7 provide information about Cisco’s dual-band antennas. How to Recover Password on Cisco 1242 Access Point?